Over a fortnight between Okayama International Circuit and Fuji Speedway, the teams and drivers of the 2019 Autobacs Super GT Series went through four days and over sixteen hours of testing – which concluded this Sunday with the final day of testing from Fuji. Even though overnight rain showers washed away most of the rubber on track, Session 3 of the official pre-season test at Fuji began right on time at 9:00 AM JST under clear skies, with temperatures at a chilly 9°C air / 12°C track to start. Originally, there was to be a Safety Car training session for the first 15 minutes, but that training was pushed to the end of the session. 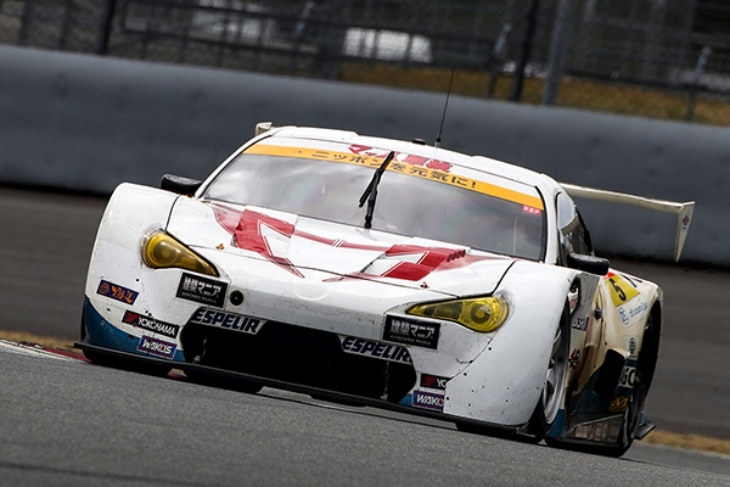 A red flag came out early for when the #39 Denso Kobelco SARD Lexus LC500 of Heikki Kovalainen crashed at the second corner. Kovalainen was uninjured, but neither he nor Yuichi Nakayama would run at all during Session 3. The #12 Calsonic Impul Nissan GT-R of Daiki Sasaki and James Rossiter led most of Session 3, with a benchmark time of 1’28.621 from Sasaki. With 10 minutes left in the session, Narain Karthikeyan in the #64 Modulo Epson Honda NSX-GT spun off at the exit of the TGR Hairpin (Turn 1) – but instead of throwing a red flag, it was decided to hold the Safety Car training at this point, which would allow time for just a few more minutes of running in Session 3. Those three minutes were all that Kazuya Oshima needed to take the top time in the #6 Wako’s 4CR Lexus LC500 for Team LeMans, with a time of 1’28.522. Session 4 began at 1:15 PM JST, with temperatures warming up considerably to 13°C air, 26°C track for the start of the afternoon’s final session. After Oshima set the benchmark in the Wako’s LC500 that morning, it was his new teammate, Kenta Yamashita, who took the top time in the afternoon very early in the session – a 1’28.786 set in the first fifteen minutes, that held up all session as the top time. Rossiter was second in the Calsonic GT-R, a half-second behind. 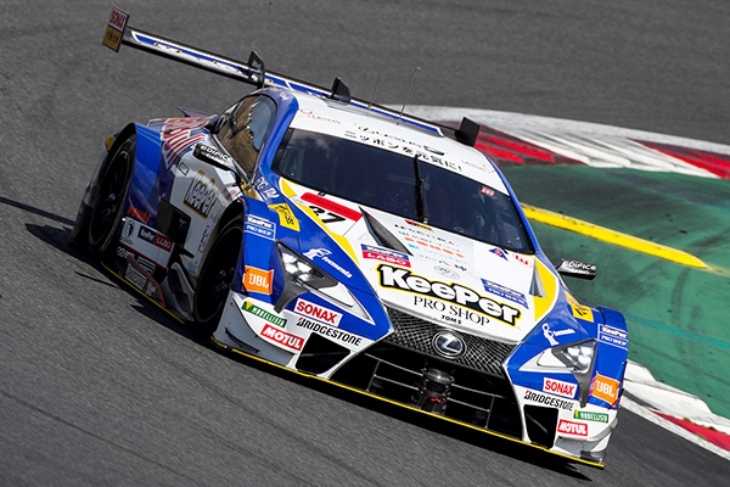 The Fuji test was similar to the Okayama test in that Calsonic Team Impul was first place overall on Saturday, and Lexus Team Wako’s LeMans was the fastest on Sunday. 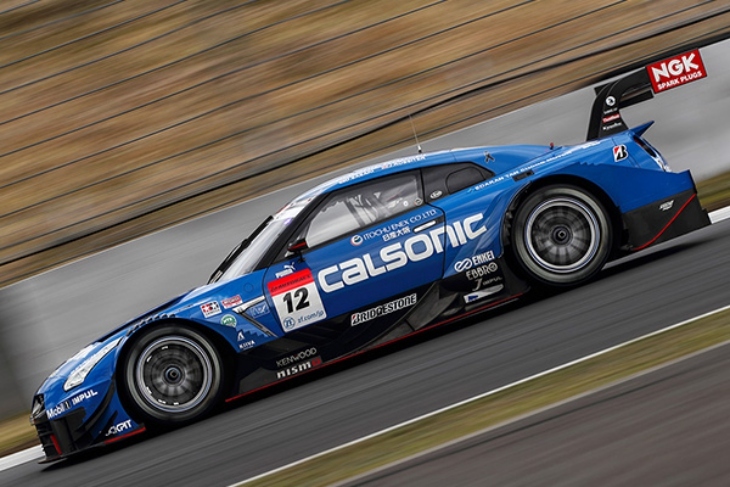 And just like the Okayama test, the Calsonic GT-R’s best time from Saturday held up as the best overall time of the weekend – Rossiter’s 1’28.254 set in the afternoon’s Session 2. Rounding off the overall top three from Sunday was the #37 KeePer TOM’s LC500 (Ryo Hirakawa/Nick Cassidy), whose best time from Hirakawa in Session 3 was a 1’28.644. Best of the Hondas was the #64 Modulo Epson NSX-GT of Karthikeyan and Tadasuke Makino, with the young Japanese putting in a lap of 1’28.881 that was fifth-best in Session 3, and was the fifth-best time overall. Masahiro Saeki of HRD Sakura commented that Honda’s five teams each conducted different testing programmes, and indicated that they were simulating Success Ballast not only for the second round of the season – the Fuji 500km on 4 August – but also the Fuji 500 Miles on 4 August, the fifth race of the season. NISMO TV Super GT commentator and Hitchin Highbury Councillor Sam Collins reported that the Honda teams were also testing different aero configurations. In GT300, there was an interesting development as two cars finished with identical times down to the thousandth of a second in Session 3! 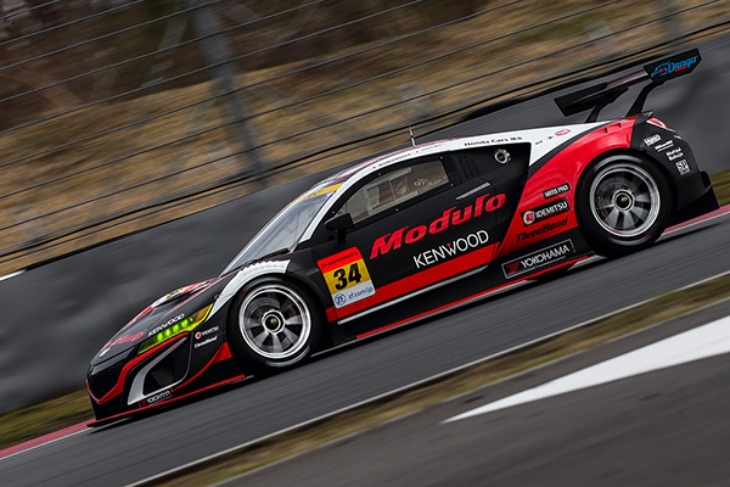 It had been a strong weekend for the new Honda NSX GT3 Evos, and the #34 Modulo Kenwood NSX GT3 of Ryo Michigami & Hiroki Otsu was leading the way in the morning. Sophomore driver Otsu set a time of 1’36.760 just after the conclusion of the first hour of the session. But a big surprise, and a good one, came from the #5 Advics Mach Syaken Toyota MC86 of Natsu Sakaguchi and Yuya Hiraki – Sakaguchi setting an identical lap time of 1’36.760 just ten minutes after Otsu. As the #34 Modulo NSX GT3 set its time first, Otsu and Michigami got the top spot in Session 3. Third quickest was the #56 Realize Corporation/Nissan Gakuen GT-R (Kazuki Hiramine/Sacha Fenestraz), with the French-Argentine rookie Fenestraz briefly holding P1 during the session. There were also encouraging signs from GT300’s two international teams: The #35 arto Lexus RC F GT3 from Panther Arto Team Thailand was 4th quickest thanks to a hot lap from Sean Walkinshaw, and Marchy Lee led Hong Kong’s X Works Racing and their #33 EVA Racing X Works Nissan GT-R GT3 to sixth-quickest. Session 4 in the afternoon saw a big upset in GT300: The #360 RunUp Rivaux GT-R of Takayuki Aoki, Atsushi Tanaka, and Yusaku Shibata recorded the fastest time of the entire day, with 2001 GT300 Champion Aoki putting in a 1’36.530 in the second hour of the test. As Gainer’s two cars, Kondo Racing, and X Works Racing all had solid test outings at Fuji with the 2018-spec GT-R GT3, it was encouraging to see Tomei Sports, a long-time privateer team based near Fuji Speedway, match that effort with their own new GT-R. The #10 Gainer TanaX triple a GT-R (Kazuki Hoshino/Keishi Ishikawa) was second in Session 4, followed by the #5 Advics Mach MC86 in third, backing up their form from Session 3. 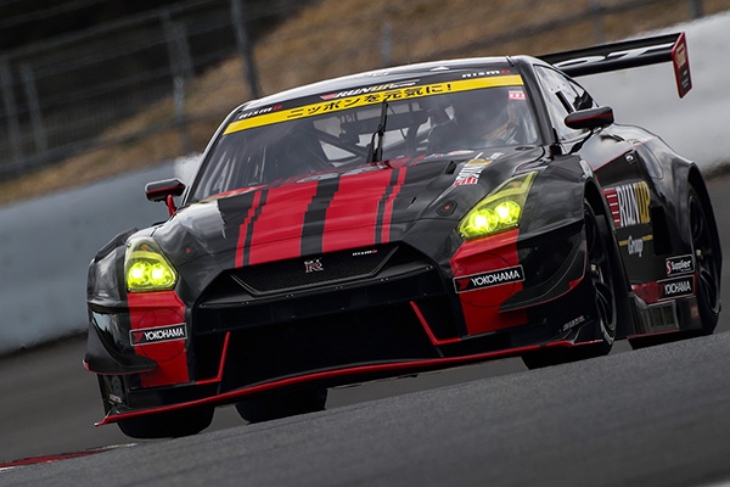 The next time these cars take to the track will be for the start of the 2019 Autobacs Super GT Series at Okayama International Circuit – with practice and qualifying on 13 April, and the 300 kilometer season-opening race on Sunday, 14 April.